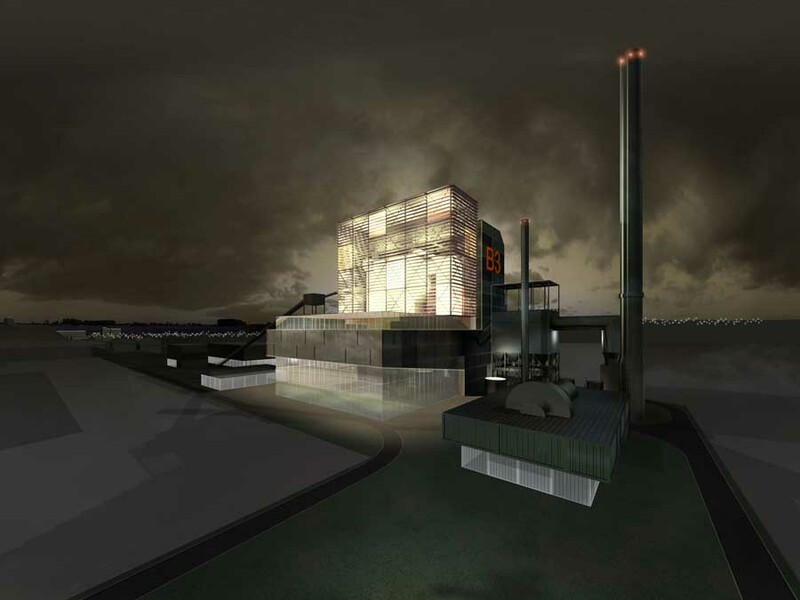 19 June 2013 – On 3 June, Forth Energy secured Section 36 consent for the largest biomass plant in Scotland, for which Ryder Architecture provided indicative designs. The plant is a combined heat and power renewable energy plant, which will be based at the Port of Grangemouth, and represents an investment of £465m. 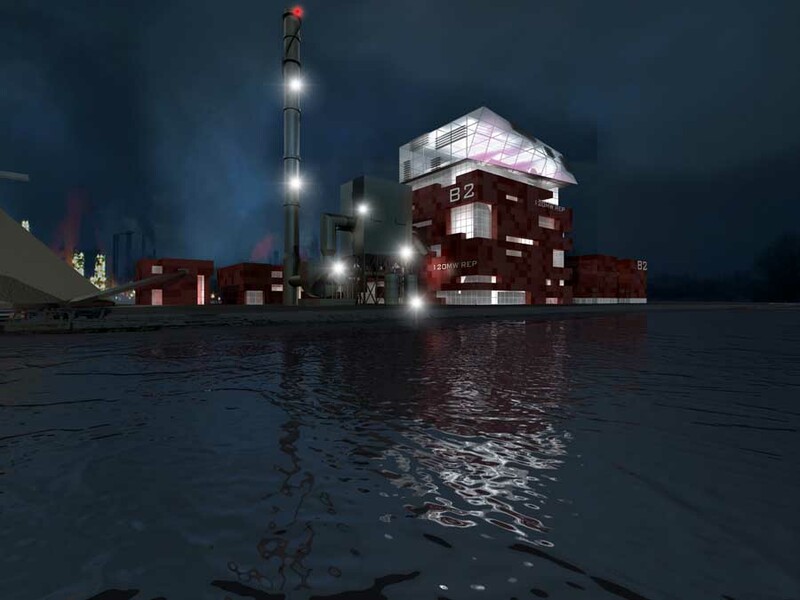 Ryder’s design draws heavily on the Port of Grangemouth’s position as Scotland’s largest container terminal, using the size and shape of cargo container as the basic building block of the new plant, stacked to orientate the higher elements of the plant away from the town to the south. 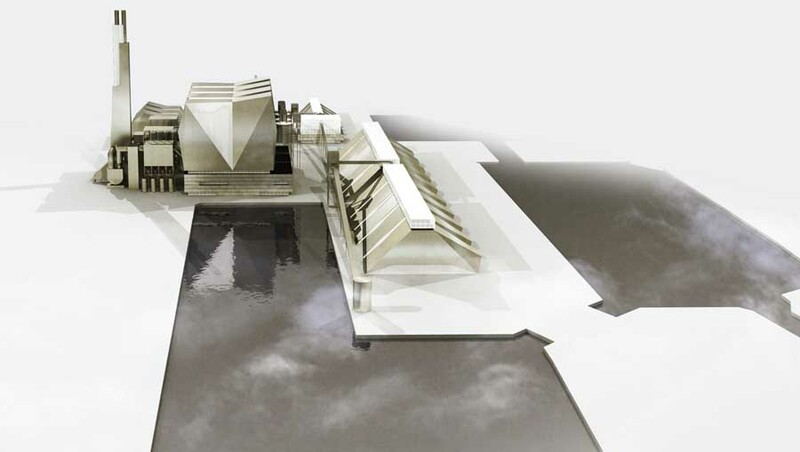 A semi translucent sculptural form encloses the highest parts of the structure, reading as part of a sequence of infrastructure set pieces in the area including the Falkirk Wheel and the Kelpie Boat Lift. 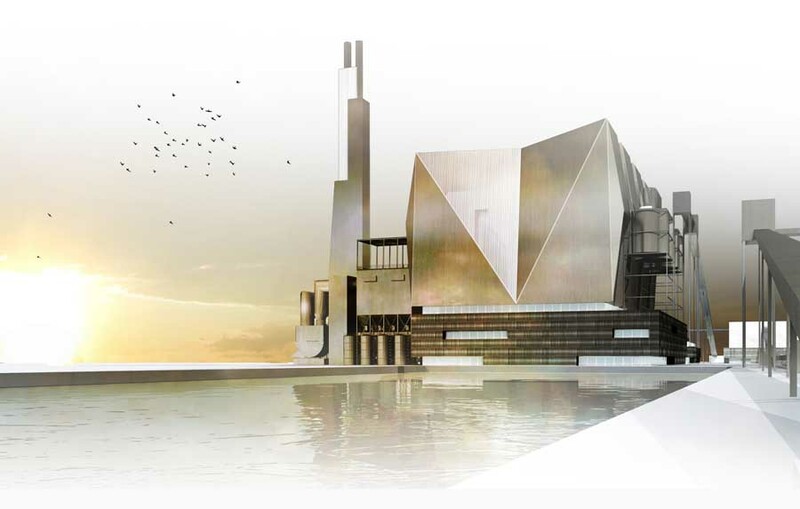 The proposed plant has the capacity to generate 120MW of electricity, which will be supplied to the national grid; and 200MW of low carbon heat, which will be supplied to industrial users. The plant will create approximately 300 construction jobs, peaking at 500 during parts of the build process, and 70 operational posts at the port. 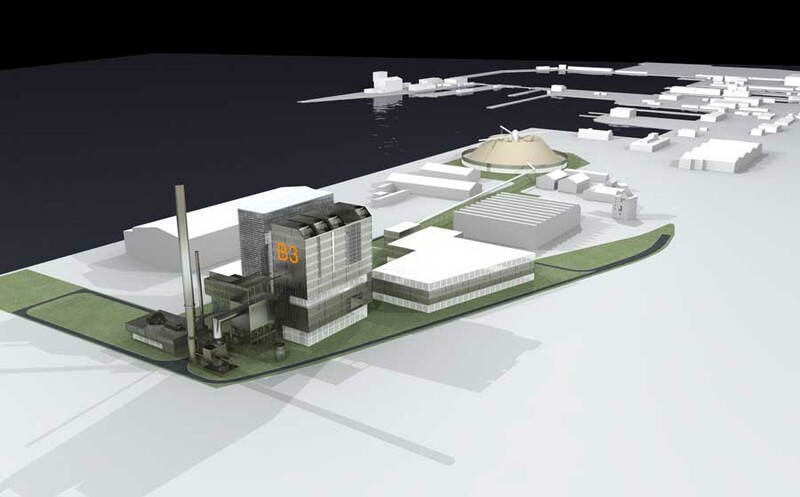 With Dundee and Rosyth, Grangemouth is one of three proposed biomass plants designed by Ryder for Forth Energy. The plants have the potential to contribute significantly to the Scottish Government’s energy strategy for renewables. Forth Energy is a joint venture between Forth Ports Limited and SSE plc (Scottish Southern Energy). Following a year’s detailed design and engineering, work is due to start on site in 2014, with a view to the plant coming online in 2017. Forth Energy has written to the Scottish Government’s Energy Consents Unit to withdraw its current application for permission to build a combined heat and power plant in Leith. 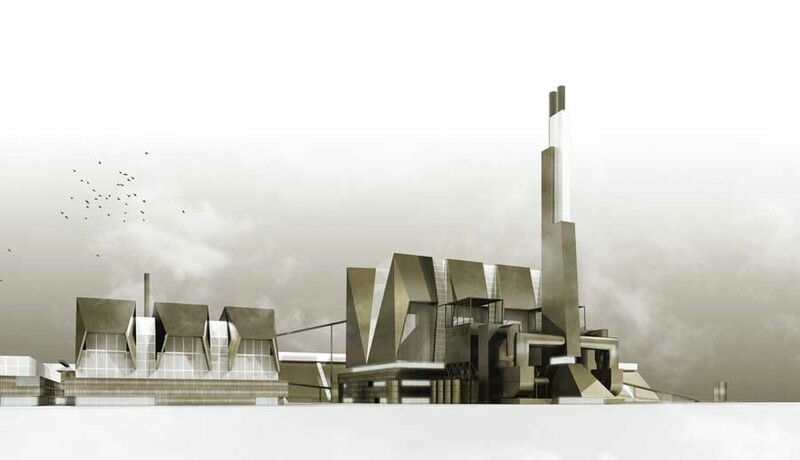 The other three CHP plants designed by Gordon Murray Architects are still due to proceed. Forth Energy, a joint venture between Forth Ports Limited and SSE plc, said the decision was made due to new proposals to develop the Port of Leith as a hub for offshore renewable energy manufacture and support and the consequent demand for space at the Port. Forth Energy will re-assess the potential for renewable energy production at the Port of Leith, owned by Forth Ports, once the full configuration of renewable companies locating at the Port has been finalised, land availability has been re-evaluated and the demand for renewable energy has been assessed. The Port of Leith has been identified by Scottish Enterprise as Scotland’s top location for renewables manufacturing under the National Renewables Infrastructure Plan; is the subject of a Memorandum of Understanding between Scottish Enterprise, City of Edinburgh Council and Forth Ports; and is within the Scottish Government’s recently-announced Low Carbon / Renewables East Enterprise Area. Forth Ports and SSE remain committed, through their joint venture project, Forth Energy, to developing wood-fuelled CHP plants at the Ports of Grangemouth, Rosyth and Dundee. 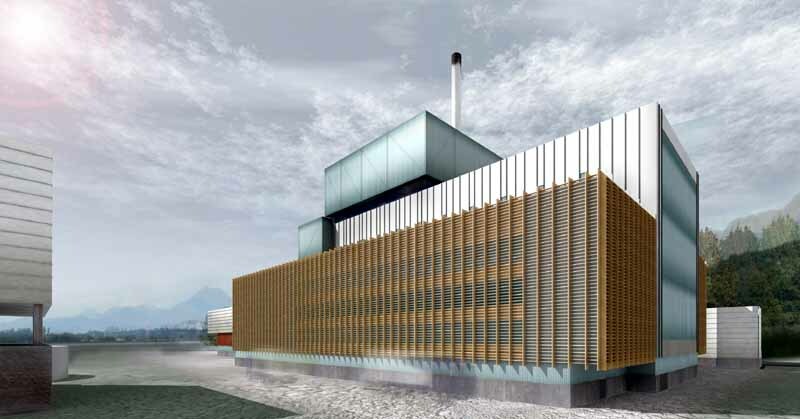 Friends of the Earth said Forth Energy should scrap the proposed £360m biomass plant in Leith. 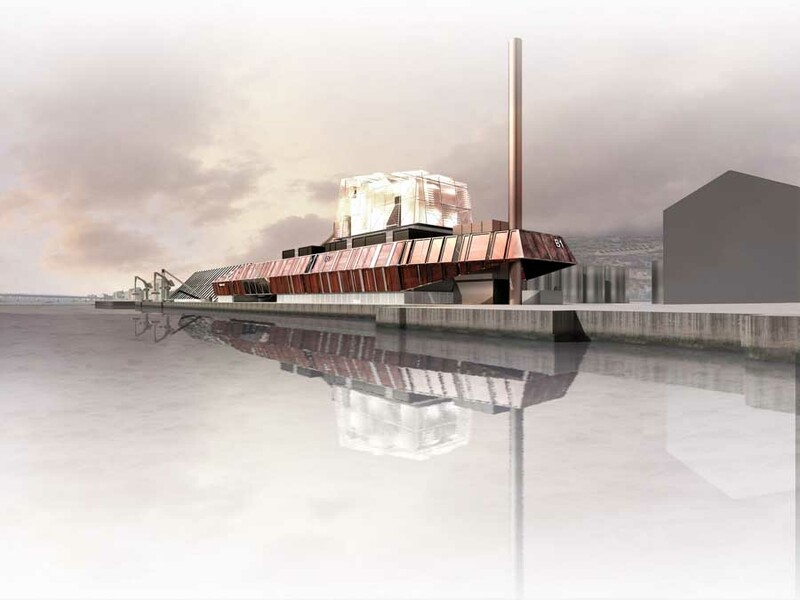 Gordon Murray Architects were commissioned by Forth Energy, a joint venture between Forth Ports Plc and SSE (Scottish Southern Energy) to develop conceptual design proposals for four new Biomass Renewable Energy Plants proposed at the ports of Dundee, Grangemouth, Rosyth and Leith, with a combined construction value of over £1 billion. Grangemouth is Scotland’s largest container terminal. 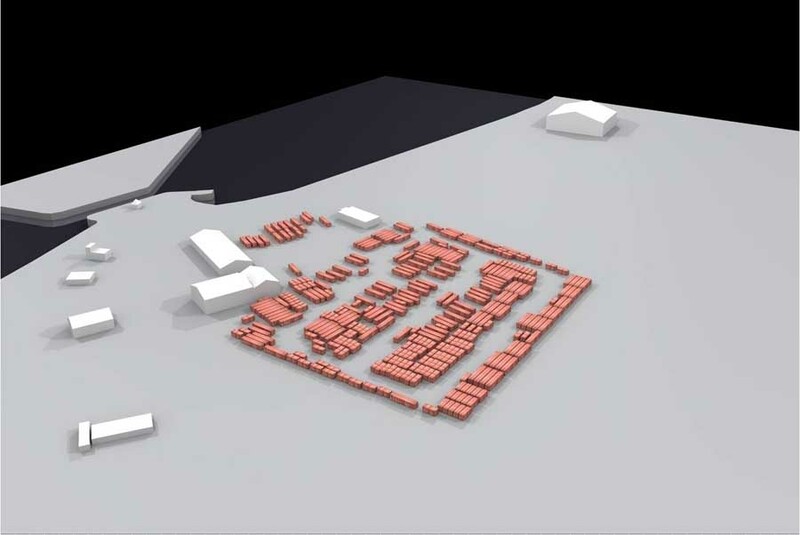 The proposed site for the new plant is also currently used to store containers. So an obvious, but appropriate move was to consider the cargo container as the basic building block of the new plant, stacked in such a manner as to orientate the higher elements of the plant away from the town to the south. 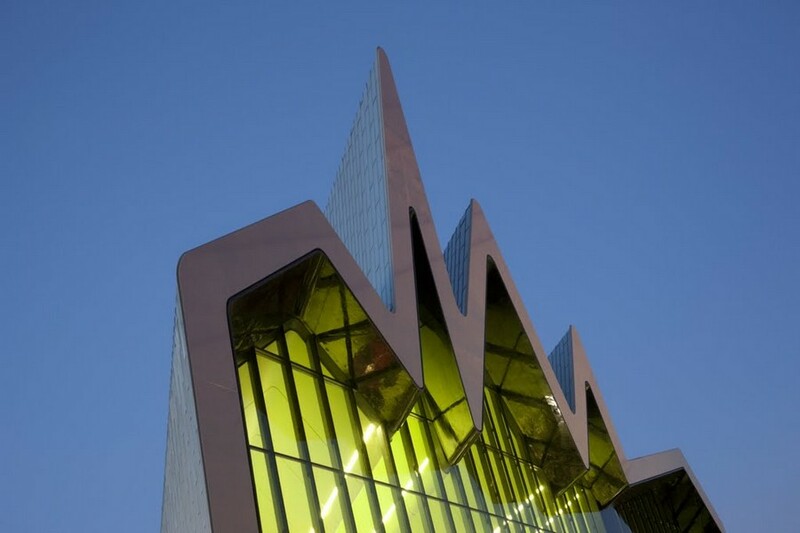 A semi translucent sculptural form encloses the highest elements, reading as part of a sequence of infrastructure set pieces in the area including the Falkirk Wheel and the Kelpie boat lift. 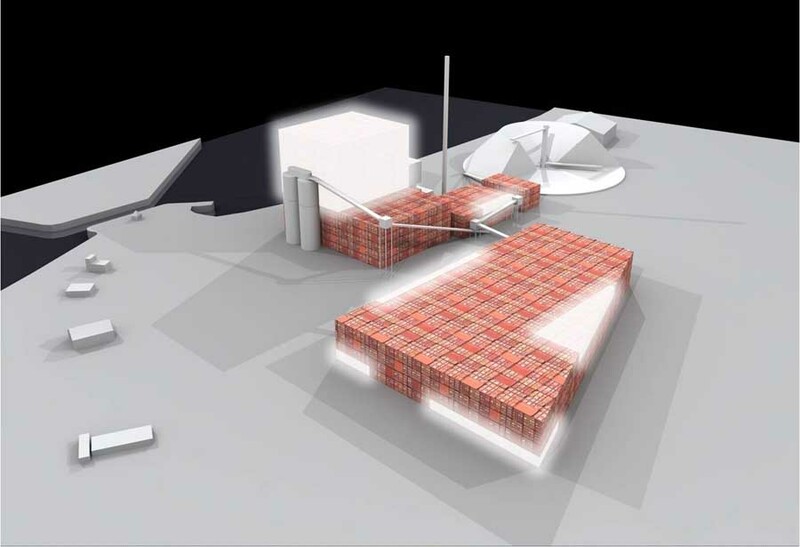 The skin of the indicative design for the Biomass Renewable Energy Plant is conceived as a series of stacked containers. These stacks are then be pulled, pushed and blocks removed, with the spaces in between being filled with polycarbonate panels allowing light into the Biomass Renewable Energy Plant, and also help to break down the mass of the large scale elements. The colour of the profiled metal panels is drawn from the range of colours found in the adjacent container yard, with large scale industrial graphics and text being used to convey information about the Biomass Renewable Energy Plant. 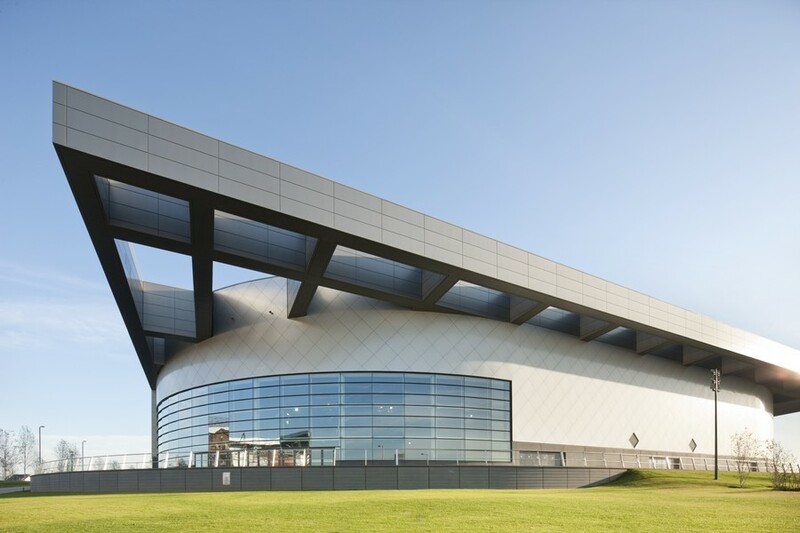 As a former naval dockyard and decommissioning pen for nuclear submarines and now the site for final construction of the Royal Navy’s new super carriers, the design of the Rosyth plant draws inspiration from the forms of submarine and aircraft carrier conning towers. The site also enjoys a strong connection to the Forth crossings, and the plant opens itself up to act as a gateway into Fife, and to also allow greater understanding of the processes within. 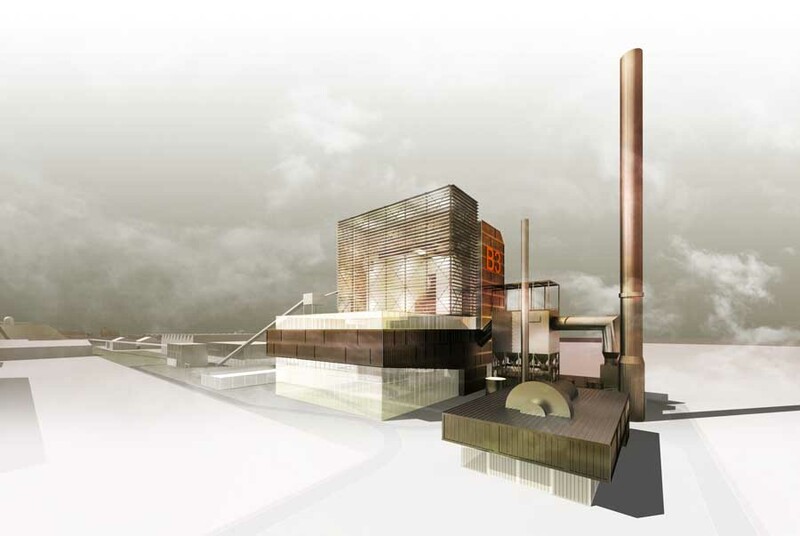 The solid elements of the boiler house would be articulated by the creation of vertical strip windows, which fragment the overall scale into a series of smaller parts. The larger opening facing northwards to Rosyth creates a profile reminiscent of the existing ruin of Rosyth Castle. With the site located at the boundary of the City of Edinburgh, and the Firth of Forth and North Sea beyond, the plant form is separated into a solid base which relates in scale to the surrounding port structures, with the higher elements articulated in a more dynamic form, suggestive of maritime imagery -clouds on the horizon, the sails of a tall ship, the crystalline surface of an iceberg. 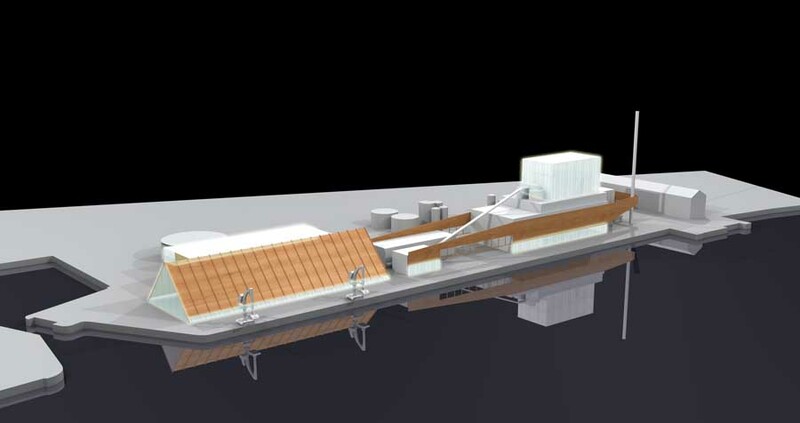 By creating a clear distinction between high and low level elements, the upper levels can be articulated to reduce the apparent bulk of the form, evoking memories of the large sail clippers which once serviced the Port of Leith, while the lower level storage structures would relate to the fabric of the existing port. 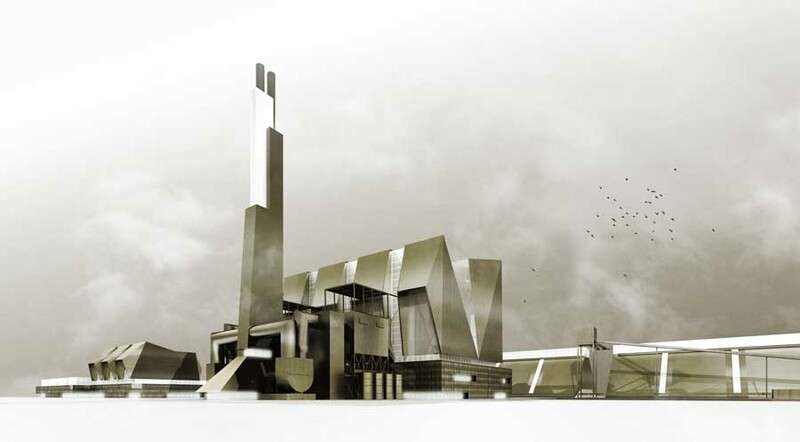 gm+ad architects have been commissioned by ScottishPower to develop prototype designs for a Biomass Power Station to be located on a brown-field site adjacent to its existing Longannet Coal-Fired Power Station in Fife. The Longannet site was chosen following a study of over 150 possible locations throughout Central Scotland. 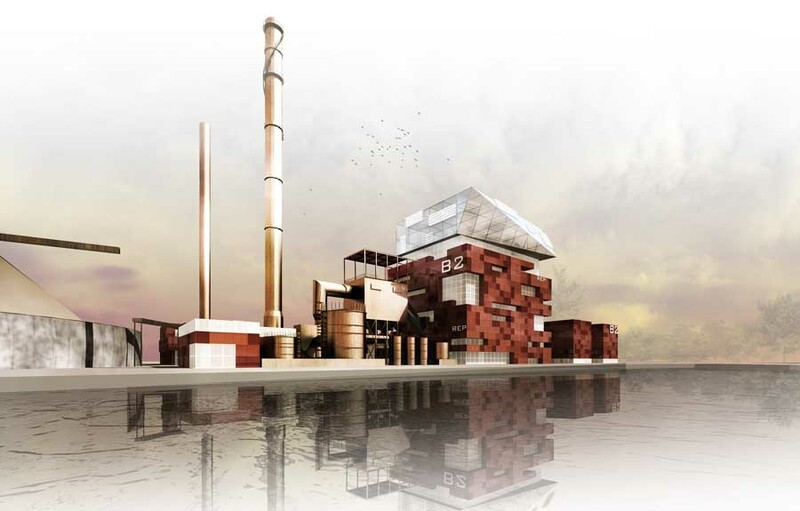 The Biomass Power Station will be fed with biomass fuel in the form of biosolids and mixed waste wood, diverting these materials from landfill and using them to produce 20-25MW of renewable electrical power for export to the grid. 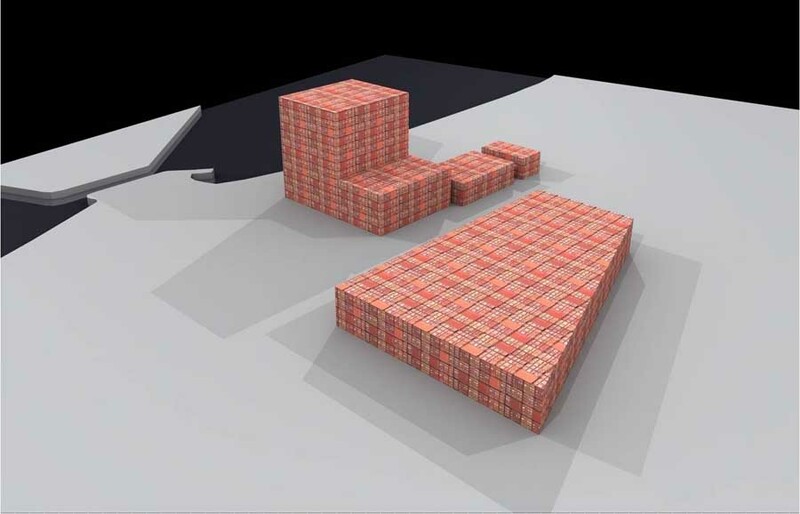 This means that biomass will play an ever-increasing role in ScottishPower’s target to provide ten per cent of its electricity production from renewable sources by 2010.